Poppy Seed Bagel (4.5"X3.5"X1.5"H) ..
Baguette 16" X 2.5" X 1.75" H .. 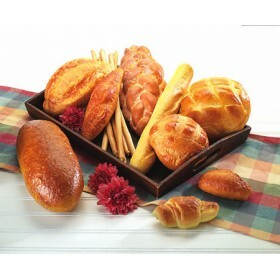 Braided Bread 15" X 5" X 3.5" H .. Bread and Cheese Kit (Board not included) ..
Rye Bread 13" X 5" ..
Set of 2 slices of rye bread (each approximately 3.5" X 1.5") ..
18.5 " Long Bread Sticks .. Approximately 4.8" X 3" ..
Poppy Seed Roll (2 7/8" W X 2 1/4" H) ..
5" Sour Dough Bread ..